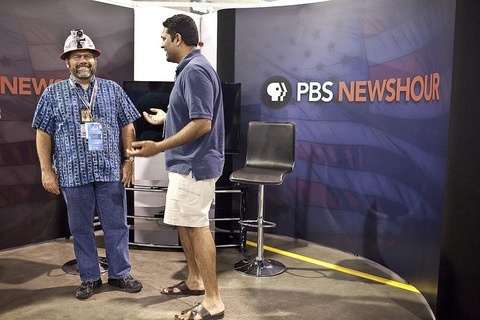 Senior correspondent Ray Suarez tries on the hatcam with correspondent Hari Sreenivasan on the PBS NewsHour set at the Charlotte convention center. Photo by Jared Soares for PBS NewsHour. It’s 8 p.m. at the Democratic National Convention and it’s time to suit up. Not in your typical business suit but with the hatcam, the latest addition to the NewsHour’s coverage of the political parties’ nominating blowouts. Somehow in the past two weeks, an idea that sounded like dreamy fun morphed into a journalistic reality executed by several game NewsHour employees, traipsing across the convention campuses and livestreaming everything they encountered. People would spot the hat, and often point and wave. Some wanted their photo taken with the hat, and many just wanted to know what the heck it was. Or take former presidential contender Michael Dukakis’ reaction in an interview with UStream, which has hosted the NewsHour’s cadre of convention livestreams. “It looks like something you’d find under the Christmas tree,” he said. Yes, the hatcam looks goofy, like a white-and-red pith helmet, but that’s been its greatest asset. 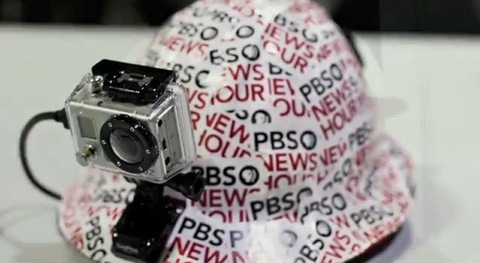 Christina Bellantoni, the PBS NewsHour’s political editor, took hatcam for a spin in Charlotte on Tuesday. “It instantly makes people smile,” she said. The hatcam becomes the conversation icebreaker. It’s a casual reporting tool that helps transform the wearer as well, from a pad-and-pen-carrying journalist to a regular fellow human being talking about life, politics, fashion, whatever may arise. The goal was to capture the convention from a delegate’s perspective. Something different, and maybe even Internet-friendly. Along the way, we’ve added extra battery power, tilted the lens and changed the microphone’s intake. Also last week, Poynter Institute’s Julie Moos and Regina McCombs raised some ethics questions about the approach. Is it OK to use the hatcam in public places, where people can’t choose whether or not they’ll be captured on video? Does it have a journalistic purpose? And what if we broadcast problematic exchanges? But the venue of the conventions worked toward hatcam’s advantage. People expect to be filmed or photographed there and see reporters at every turn. Politicians and other personalities are on their home political turf and in celebratory moods. We still tried to explain to those around us what hatcam does and how it works — and that everything it sees could end up on the web. As to the question about maintaining journalistic integrity, we point to the NewsHour’s national broadcast for exemplary technical work. The light conversations and forgivable video fit better with the hatcam’s style. It’s another way to see America. For a playlist of highlights, visit our YouTube channel. Or watch the hatcam live here … while you can.